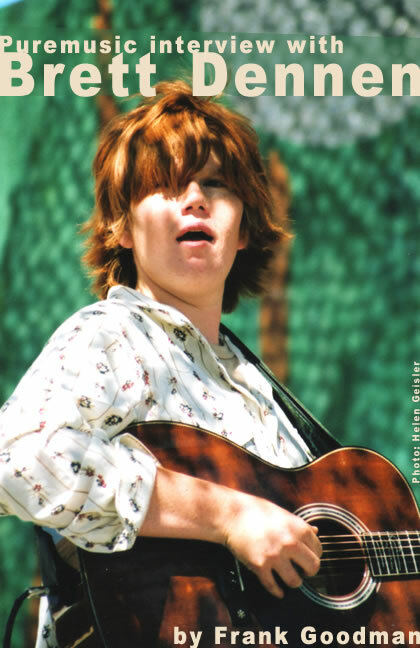 He's like a new kind of human being to me, this Brett Dennen. After spending time with him this week, I feel that way even stronger than after the positively confounding impression that his new CD, There's So Much More, left on me. If he'd said that he was an alien, I could have swallowed that; it would even have made sense to me. Because I'm simply not accustomed to meeting and spending time with people that appear to be so incorruptible, so odd and yet so self-assured; so, uh, enlightened and inner-directed, if I might venture all that. At 27, no less. But he's every bit of that, and there's no telling what this West Coast youth might get up to next. His tunes are hitting the Television, via Grey's Anatomy and Men In Trees, and he's out on tour with John Mayer and Sheryl Crow. Come on, now. He's got one self-released record, and one out on Dualtone Records, an astute but small label in Nashville, better known for alt-Country releases. How do you get there so fast with that little infrastructure? His music is great, first of all. His tunes are so infectious and so deep at the same time; they're a perfect blend of those usually disparate qualities. His playing is damned convincing, and his singing is like no one else. It's a very high voice, but with that inner directedness that makes it Strong. Also, he's getting there because the little infrastructure that's gathered around him is of the highest caliber. He's got an inspired manager, a publicist on fire, and a hot little label that's behind him every step of the way. And he's knocking very important people like John Mayer dead, who got him on that tour, even after he and Sheryl Crow decided to co-headline.